Aphanomyces root rot (Aphanomyces euteiches) has been identified as a significant alfalfa disease for over 20 years now. Alfalfa is known to be susceptible to numerous root diseases including Bacterial wilt, Fusarium wilt, Phytophthora root rot, Pythium, Verticillium wilt, and Aphanomyces. In Wisconsin, the two primary seedling blight/root rot diseases that can significantly impact alfalfa stand establishment are Aphanomyces and Phytophthora. Both diseases are caused by oomycetous fungi that are especially present in wet or poorly drained soils. Aphanomyces has presented a particular challenge because there are at least two significant races that are detrimental to alfalfa. As a result, alfalfa needs to be screened for resistance to Aphanomyces Race 1 and Aphanomyces Race 2. Aphanomyces Race 2 is widespread with cases identified in Idaho, Maryland, Minnesota, Mississippi, North Carolina, Tennessee, Virginia, Iowa, Kentucky, and Wisconsin (Malvick 1998). Race 2 is considered more virulent (Peters and Grau 2007). Recently, alfalfa genetics suppliers have been releasing new alfalfa varieties with Race 2 resistance which typically conveys resistance to Race 1. In new seedlings, symptoms often appear in the form of stunted, yellow plants with overall poor root development and few lateral roots. Infected seedlings develop yellow cotyledons and chlorotic first true leaves (Undersander et al. 2004). Aphanomyces root rot is distinguishable from pathogens such as Phytophthora and Pythium because these two diseases cause a more rapid wilting than Aphanomyces (Undersander 2007). 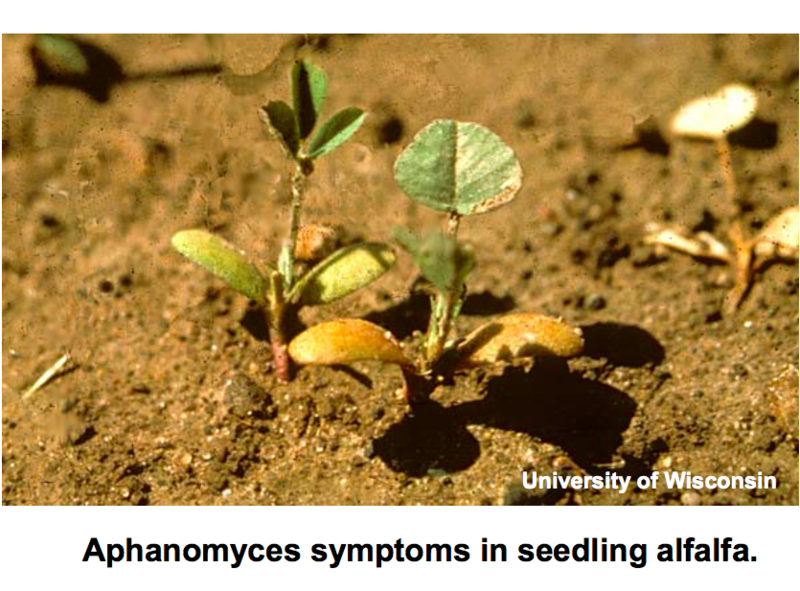 Seedling death is more commonly caused by Phytophthora than Aphanomyces. Roots and stems of Aphanomyces infected seedlings initially appear gray and water- soaked, and then turn brown. These seedlings will remain upright (Grau 1990). In established stands, Aphanomyces reduces yield due to poor root growth and less nodulation. Infected mature plants are slow growing in the spring after breaking winter dormancy and rebound slowly after harvests (Grau 1990). Stand longevity is reduced when this pathogen persist in established plants. Currently two races of Aphanomyces are recognized. Race 1 is relatively widespread throughout alfalfa- producing regions in Wisconsin and Minnesota. Alfalfa varieties resistant to this variant of the pathogen became readily available to alfalfa producers in the 1990’s. Failures in the performance of Race 1-resistant breeding lines/varieties led to the discovery of Aphanomyces Race 2, and subsequent development of Race 2-resitant alfalfa varieties. While Race 2 was first found primarily in southwest Wisconsin and southeast Minnesota, in recent years, Race 2 has been reported elsewhere in Wisconsin. More disturbing are reports of failures of Race 2-resistant varieties, suggesting the existence of additional races. The most accurate way to determine the presence of Aphanomyces Races is to submit soil samples to the University of Wisconsin-Madison Plant Disease Diagnostic Clinic. Since soil bio-assay techniques are used, adequate time is required to process a sample: at least 30 days. Approximately one cup of soil should be gathered from 25 locations throughout a field and then combined for a total volume of at least 1 to 2 gallons. Samples should be collected from the upper 6 inches of the soil profile. If samples can not be immediately submitted to the UW Plant Disease Diagnostic Clinic, then they should be kept cool or frozen until they can be delivered. The UW Plant Disease Diagnostics Clinic, in partnership with Pioneer Hi-Bred International, has been conducting a survey of Wisconsin and southeast Minnesota agricultural fields to determine which, if any, races of Aphanomyces are present in alfalfa production areas. The survey will eventually include samples from 300 fields. The survey also provides information on the presence or absence of Phytophthora in the sampled soils. The goal of the survey is to not only identify the distribution of Aphanomyces Race 1 and Race 2 in the region, but to also document and further study locations where Race 1 and Race 2 resistance fails. Over half of the projected 300 samples have currently been analyzed. Soil collection and testing will continue throughout 2008. Preliminary results have shown a considerable prevalence of Aphanomyces Race 2 in the fields submitted. More than three times the number of soils have tested positive for Aphanomyces Race 2 than have tested positive for Aphanomyces Race 1. Race 2 positive soils have been detected in all regions of the state. The number of soils testing positive for Phytophthora is approximately equal to the number of samples that have tested positive for Aphanomyces Race 1. The soil bio-assay used in this survey includes two different types of alfalfa that are resistant to Aphanomyces Race 2. The two breeding lines/varieties have been developed from different sources of resistance, and appear to be performing differently in some soils. This finding is of particular interest when considering the possibility of the existence of an additional race(s) of Aphanomyces in Wisconsin soils. Additionally, more than 1⁄3 of the soils tested have either shown poor growth across all breeding lines/varieties used in the assay, or a weakness in all resistant varieties in comparison with the standard susceptible variety. This uniformly poor growth could indicate the presence of an unidentified race of Aphanomyces or presence of another currently unidentified pathogen. In summary, initial results of the survey suggest a high frequency of Aphanomyces Race 2 in Wisconsin. There is currently no visible geographical pattern to the pathogen distribution, although this will be re-evaluated as additional soil samples are tested. Resistant varieties performed poorly in soils from several fields and these fields warrant follow-up and additional testing, as these fields may contain an additional race(s) of Aphanomyces or other pathogens of interest. As the survey and follow-up testing is completed, further information will be made available to the public. What steps can I take to manage Aphanomyces? Scout and sample for Aphanomyces in alfalfa. If Aphanomyces is present, then select alfalfa varieties with resistance to the Race that is present. Selecting a variety with Race 2 resistance will typically protect against both Aphanomyces Races. If seedlings of varieties of Aphanomyces Race 1- and 2-resistance show seedling blight symptoms, submit a soil sample to the UW Plant Disease Diagnostic Clinic. Review the annual Forage Variety Update for Wisconsin (A1525) to identify varieties with Aphanomyces Race 1 and Race 2 disease resistance ratings adequate for your farm (Undersander et al, 2006). Adopt land conservation practices that discourage standing water. In wet locations, either plant alfalfa varieties with high disease resistance ratings or consider planting a more suitable forage species. Undersander, D.J. et al. 2006. Forage variety update for Wisconsin. Publication A1525. University of Wisconsin Extension. Undersander, D.J. et al. 2004. Alfalfa management guide. NCR547. p. 29.